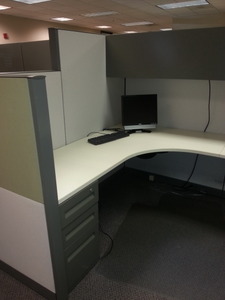 These 6X8, Steelcase Answer cubicles are in great condition and can be shipped to you within 4 days of your order. We currently have 32 of these cubicles. Each cubicle is 66″ tall dropping down to 54″ tall. Each used cubicle includes one box box file and one two drawer lateral file.